If you like adding flavor to your texts by using GIFs and stickers, then you should be excited to know that the latest Giphy update makes it possible for iOS users to create their own stickers that can be introduced into texts. The Giphy extension can also be added to the native iOS keyboard so that users can get faster access to their favorite GIFs and sticky. iPhone and iPad owners who updated or downloaded the new version of Giphy are now going to see a brand-new icon on the bottom left-hand corner side of the iPhone or iPad. The feature sports an icon that looks like a globe and it is the new sticker-making tool that iOS users can access. We should note that the sticker-making tool is available only to iPhones and iPads that are running on iOS 12 or higher. Another great thing about the latest Giphy update is the fact that iPhone X, iPhone XS, XS Max and XR will get access to an exclusive feature. This Giphy feature uses Apple’s new TrueDepth camera technology in order to make it possible for users to create and record their personalized animated Giphy stickers. In addition, all personalized GIFs and stickers can be saved as favorites or edited to add things such as loops, trimming and captions. 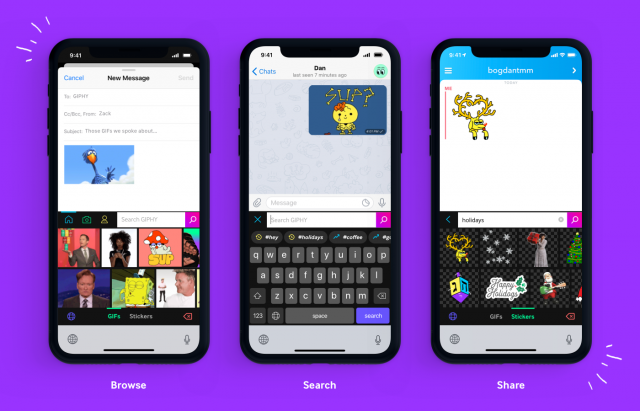 Giphy acquired a smaller company named Tapslash earlier this year and this company is believed to be behind the new personalized stickers and GIFs that iOS users can access. Also worth noting is that Tapslash has launched its own keyboard extension that works just like Giphy. Nonetheless, it’s great to see that Giphy keeps adding more features to its app which make it easier for people to express themselves.